Enlarge/ The in-game photo mode has a variety of filters and frames to play with. 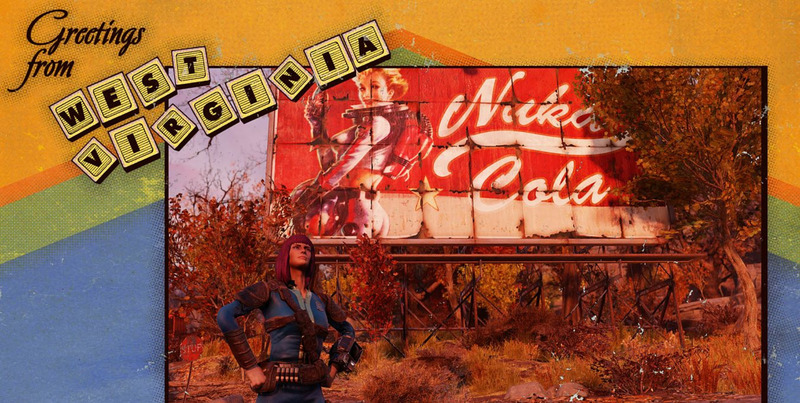 Situated squarely in the coal mining region of Appalachian West Virginia, Fallout 76 does a good job of incorporating real-life towns and landmarks into the franchise’s deep lore. Clues left throughout the world show how the arrival of Vault-Tec initially offered the community a more promising future, particularly for those attending Vault Tech University or who chose to stay in the prestigious Vault 76. The West Virginian wasteland is full of familiar creatures like deathclaws, feral ghouls, and other mutated monstrosities. Despite the new environment, Fallout 76 reuses a lot of assets from previous games in the series, particularly Fallout 4. This sometimes makes it feel like you’ve seen it all before. Paired with the lack of interesting characters, the irradiated version of West Virginia doesn’t quite live up to its potential. That said. there are plenty of new nightmare-inducing baddies. Most prominent are the Scorched humans who have fallen prey to a mysterious disease that’s at the forefront of Fallout 76’s main storyline. Unlike ghouls, they can still competently use weapons, making them more dangerous than the average irradiated corpse. Those trapped in mining suits when the bombs fell turned into mole miners, stout little creatures that pack a big punch. Local myths like the terrifying Wendigo bring a touch of area-specific lore, and you might even run into the mysterious Mothman in the wastes. As the first online-only entry in the long-running Fallout series, Fallout 76 eschews the usual cast of colorful non-playable characters in favor of scattered robots, holotapes, and notes strategically placed throughout the world. There are no computer-controlled humans, so the only other people you’ll see are live players who’ve emerged from the same vault. This is sensible on paper, but in practice, it makes the vast Appalachia region feel incredibly lonely. At Vault-Tec University we learn how to manipulate humanity. It’s like 10,000 soaps when all you need is to not die in a nuclear blast. Flight delay due to nuclear apocalypse. Red Rockets and train stations provide access to your stash boxes. The only good commie is one that’s dead. Other players can use the resources in your C.A.M.P. Or destroy it. This mining community appears to have fallen on hard times before Vault-Tec’s investment. Teaming up with another player is easy. Getting them to cooperate for a photo? Not so much. Playing instruments in the wasteland will give you a temporary Well-Tuned bonus. Early on in Fallout 76, you’re tasked with tracking down a group of Responders: civilians who took initiative in the early days of the nuclear apocalypse to help others by providing healthcare, clean water, and basic training. This tracking quickly becomes tedious once you realize that all you’re going to find are corpses. It’s a trend that repeats throughout the game. Whenever you find a note, tape, or radio station pleading for help, you know with certainty that your eventual target will either be long gone or mechanical. Playing alone can be a serene, enjoyable experience, but even at the best of times, it’s hard not to feel like something’s missing. Despite the map being many times larger than Fallout 4’s, the world of Fallout 76 feels smaller and emptier. Previous Fallout games were full of NPCs with vibrant personalities; this time around, the only person with any defining characteristics is your own character. The character creator is deeper than in previous games, allowing you to customize face and body shape, skin and hair color, and more details of your own personal vault dweller. One improvement is that outfits can now be worn over armor, so you don’t have to sacrifice protection in the name of personal style. Every player you encounter will have their own distinct style, whether they’re wearing a Civil War-era dress and gas mask or showing their Vault 76 pride in a blue and yellow bodysuit. You can also build your own home through the game’s C.A.M.P. system, which plays out similarly to Fallout 4’s workshops. You’ll have to find plans to build things like chemistry stations, cooking fires, and beds, but with a little effort you can make an impressive hub to store your extraneous items, heal up, and develop better weapons and armor. Unfortunately, your camp will be exposed to the dangers of the wasteland, including other players, while you’re exploring the rest of Appalachia. Spending the resources to build extravagant buildings and lush gardens feels pointless when any random player can come by and wreck your stuff. Sure, you can make turrets and defenses, but how long will that really hold anyone off when you’re off doing something else? Thankfully, once you sign off, your stronghold leaves the server too, but it wasn’t unusual to come back from a few hours of exploring to find broken walls and wrecked crops. While creating settlements in Fallout 4 was a robust, creative experience, setting up camp in Fallout 76 is more of a means to an end; a mere place to stash your stuff, repair your weapons/armor, and sleep. And because you’re sharing servers with other players, you might lose your prime real estate if someone else decides to set up while you’re offline. In these cases, your structure is saved as a blueprint, so at least it’s easy to rebuild. Fallout 76 also has workshops, but they’re so maintenance-heavy the effort to claim them hardly feels worth it. You’ll have to constantly defend workshops from hordes of enemies, making it feel like a full-time job; since you can move your camp at any time (for a small fee), there’s no real reason to waste precious materials building up a public area.